Thomas Sando and his aviation students learn about planes at Sloulin Field International Airport. Photo courtesy Tanner Overland, Overland Aviation. 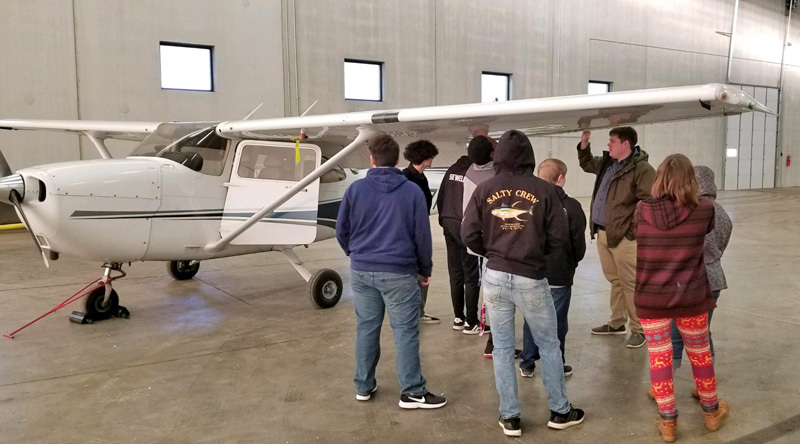 Having just returned from winter break, Thomas Sando, Aviation Instructor at Williston High School in Williston, North Dakota, is launching his second semester teaching aviation. His students are getting a head start as pilots with the school’s new STEM Aviation program, and we wanted to share his success! Students test a DIY wind tunnel made from cardboard and a box fan. Photo courtesy Thomas Sando. Aviation is something I’ve always been passionate about. Although most of my family members are teachers (my grandparents, mother, and aunts), I never considered doing it myself until the principal at Williston High School approached me about the idea of teaching aviation. I spent my entire career thus far working in airport operations, so it took a while for me to decide if I wanted to switch. I started substitute teaching with the school district early in 2018 and officially started as the aviation instructor in August 2018. In my first semester, the kids learned about everything from the fundamentals of flight to the history of aviation. I think teaching outside the box and giving them the freedom to choose their own path offers them the best opportunities. For example, for one project they were asked to research any aircraft they wanted to learn more about. 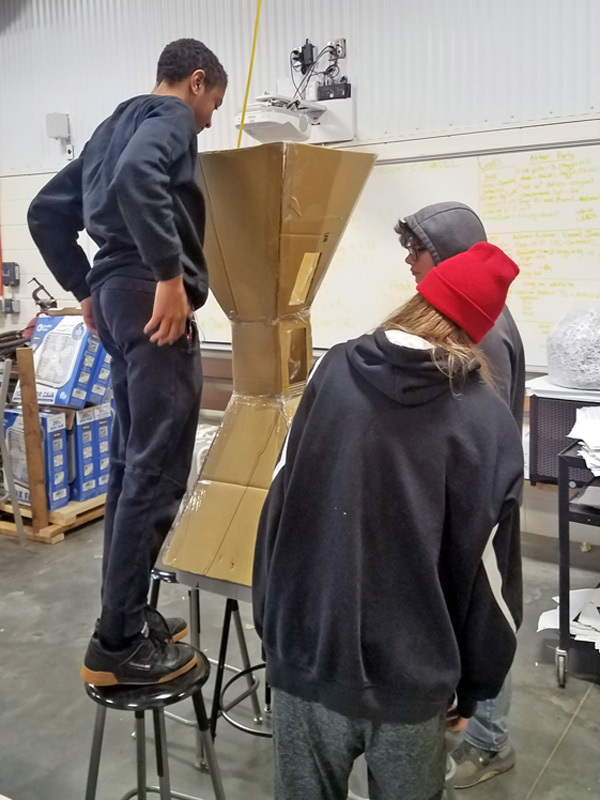 Some students chose to research rockets like the Saturn V or the SpaceX Falcon Heavy. Although that wasn’t exactly what I had in mind, it was fine because my goal was simply to inspire them to ask “why?” and be there to help them discover the answers along the way. Kids want to learn, and it is the job of an educator to give them a direction and let them run with it. This is a new program, so there is ample opportunity for growth. One day, I hope to have an airplane for the kids to learn to fly and even have them build one. Student flying the Gleim Virtual Cockpit simulator in Thomas’s classroom. Photo courtesy Thomas Sando. I quickly realized I wanted to use flight simulators in the classroom. Simulators are a great tool because if students fail or make mistakes, they can try again without serious consequences. I looked at a few options before I decided to go with the Gleim Virtual Cockpit. It was the best bang for the buck, and working with a company that puts education first was also important. My class currently has six simulators from Gleim, and eventually I want to get more! I like the fact that Gleim uses X-plane and that the flight training lessons are very realistic. A great feature about X-Plane is Plane Maker, in which you have the ability to design your own aircraft and test it. I already have some of my students not only interested in flying, but also designing aircraft and experimenting with what does and does not work through trial and error. Thomas’s classroom at Williston High School. Photo courtesy Thomas Sando. Although this is my first year teaching, I have been involved in aviation since I was in high school. 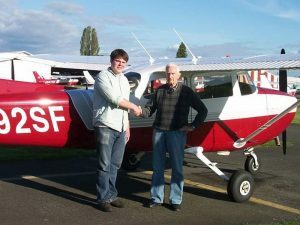 My first flight in a small plane was with my uncle in his Challenger Ultralight over the hills of eastern Washington and northern Idaho. In high school, I was a Civil Air Patrol Cadet and always wanted to fly C-17s for the Air Force, but that dream did not come to fruition. That did not stop my passion for aviation. I have worked in many different positions, including as a customer service agent for Kenmore Airlines and as a line-service technician for Galvin Flying services in Seattle at Boeing Field and Landmark Aviation and Signature Flight Support in Williston, North Dakota. Thomas Sando just after passing his FAA checkride in 2013. Photo courtesy Thomas Sando. 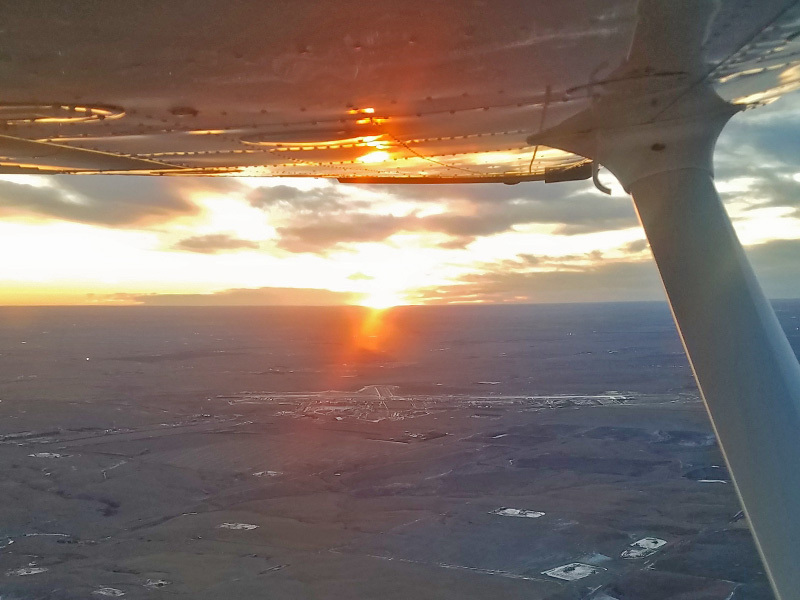 Just before I started teaching, I worked in airport operations at the Aspen/Pitken County Airport and Williston Airport. I have a degree in Aviation Business Administration from Embry-Riddle Aeronautical University and my private pilot license. My goal is for this program be a place where high school students can explore a possible love for aviation. I want it to be the class I dreamed I could have taken in high school. I am not only showing my students that they can be pilots, but that the world of aviation is open to so many jobs. I truly believe that if you love airplanes and have a passion for flight you have a place in aviation. Even if my students choose not to pursue aviation as a career, my hope is that they come away with a greater understanding of aviation and a better perspective of what the world has to offer them. Look everywhere for resources. Explore all your options. I use a combination of teaching styles and types of media for educating my students. 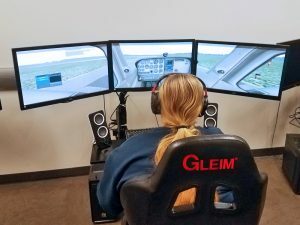 The Gleim Flight simulators are my go-to resource, but I supplement simulation time with resources like aviation textbooks and videos. This week we are using free activities from the Civil Air Patrol and building wind tunnels out of cardboard and box fans. If I want to know more about a specific topic, sometimes I just Google it and see what comes up! Flying a Cessna 172 in North Dakota. Photo courtesy Thomas Sando. Inspire your students. The biggest thing teachers need to keep in mind is that students don’t necessarily need someone with all the answers–they need someone who inspires them to keep doing what they love. We are lacking the inspirational role models and heroes of the 20th century. During the 60s, the media sold the public on the space race. The great leaders in aviation of that time became teachers and role models. Sometimes we watch short documentaries about aviators from the show Legends of Airpower, so students can learn about these inspirational figures. Expectations and reality aren’t always going to match up. Remember that your students are in high school and they don’t always do what you expect. You’re not going to have kids fully engaged 100% of the time, but don’t get discouraged by that. If a project takes longer than you expect it to, don’t rush it, because it’s better to take longer to truly understand something than to cram it. If you rush through complicated subjects like aerodynamics or how a wing works, they don’t always sink in. Make sure to review concepts thoroughly and often. On that note, don’t just teach aerodynamics and never come back to it. Review it thoroughly. You will need to keep going over topics to make sure they stay fresh in your student’s minds. If you are not a pilot, rely on industry experts. Call your local flight school. The aviation community likes to help others because it is such a small community. 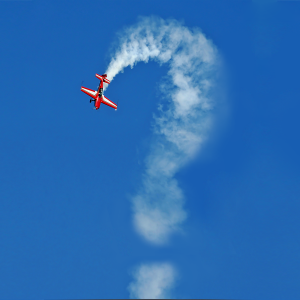 Reach out to aviation businesses and pilots you might know and invite them to speak to your class or ask for tips. I called Gleim for help and said, “Hey, this is what I need. What can you do for me?” and they were very accommodating! Ask other teachers for help. Don’t be afraid to reach out to other teachers because the majority of us are willing to share what we’ve learned. Alternatively, if you come across something that is new and interesting–share it! The only way aviation instruction is going to get better is if we share information. Don’t be afraid to fail. Don’t be afraid to try something, even if you are worried it won’t work out. Now that Thomas has shared these tips with you, let us help you stay connected. Are you interested in teaching aviation? Contact us to learn about resources you can use in your classroom. This entry was posted in News, STEM. Bookmark the permalink.